Woohoo! It’s Thursday—I can taste the weekend already. And if that doesn’t get you in a good mood, then I don’t know what will. 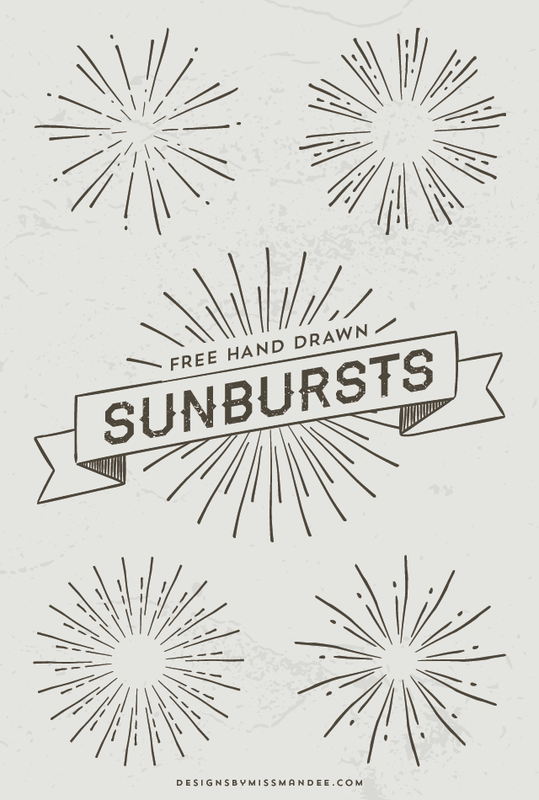 Just kidding, I do—some wonderfully fantastic hand drawn sunbursts! Aren’t these awesome? I’ve seen this motif in a lot of designs lately, and just found out that it is called a “sunburst” (go figure). These would be great for logos, overlays, or badge designs! On completely separate note, things have been getting a little crazy around the Thomas home! We have been in the process of buying our first house for the past few months (so exciting). You probably already know this, but when you put an offer on a house, that is only the first little baby step in actually buying the dang thing. The first house we put an offer on didn’t work out, and so this second time around, I’ve spent every day thinking in the back of my mind, “This could still all fall through at any moment.” So, I haven’t exactly prepared very well to, you know, MOVE. Things seem to be progressing rather quickly now, and we’re going to be moving into our home in two weeks—TWO WEEKS! Guess how much of our stuff I have boxed up (if you guessed 0%, you are correct). So…I should probably get working on that…like right now. Anyway, sorry to go off on such a random tangent. Everything is just starting to hit me with this house thing, and I couldn’t help but write about it. I hope you love these new sunbursts though! Go design something rad with them! And do check out the adorable hipster owl prints I posted earlier this week—they are not to be missed! I had just finished a card using a sunburst I drew myself when your post showed up and yours was much nicer than mine. I used yours for a birthday card for my son. Thank You. Oh, no way! Haha, that is too funny. XD What perfect timing!! These remind me of the Art-Deco period I love so much! Thank you for offering such great freebies, Mandee. And thank you so much for linking up with us at the Thank Goodness It’s Thursday link party! I can’t wait to see what you bring to the party tomorrow. Yeah, they do have a kind of art deco feel to them, don’t they! I love art deco too (if you couldn’t tell from my logo;). Thanks for the pin Linda! Aww these are pretty. Thanks for posting. Hello from Whimsy Wednesdays. Love these sunbursts! Thanks for sharing!